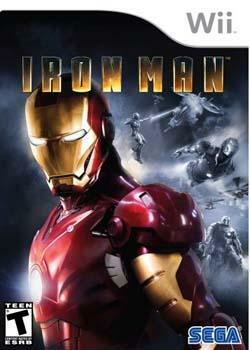 Hailing from a different developer than the PS3/Xbox 360 counterparts, Iron Man for the Wii/PS2/PSP was created by Canadian studio A2M (Artificial Mind and Movement, minds out of the gutter people). The game is a completely different experience than its current generation system counterparts, though it does use the same actors and compressed video cinematics to tell an identical story. In a nutshell it’s a loose retelling of 2008’s Iron Man with additional villains added in to make the game longer. A2M was wise to try and not compress the HD versions into the less powerful consoles and the product greatly benefits from this, though that doesn’t mean that these three versions of Iron Man are really that great either. That being said, they do have one of the best opening levels in recent memory. You play in the Mark I armor which is impervious to damage, lighting your foes on fire with your flamethrower all the while “Iron Man” by Black Sabbath plays in the background, in a word, AWESOME. The rest of the game outside of the first level is nothing to write home about. It plays a lot like its current gen counterparts but it’s a lot easier and less thrilling. The game feels a tad longer than the Xbox 360 game, but in this case that’s not a good thing. The graphics are sub par, which is understandable as these games are made for under powered hardware, but a decent art direction can make any game stand out. 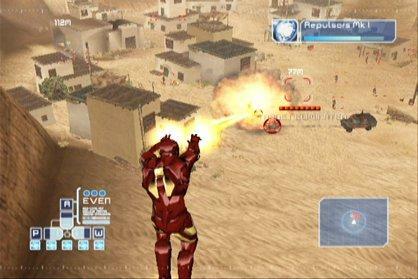 Instead you’re left with some bland environments, a lack luster Iron Man suit and weak explosion effects. You’ll blow up a tank only to see if turn red then disintegrate. These versions have their variation on the power distribution mechanic but it doesn’t work nearly as well. You can move power to melee, thrusters, weapons or an even distribution. The problem is the most reliable weapon is your repulsor, which can run out of power. One would think you would just route power to weapons to correct this, but doing this just enables the unibeam. So if you’re repulsor starts getting weak, you have to route your systems to even, or if they’re already on even, to another power source than back to even. The other versions had the unibeam as an alternate button which freed up the weapon distribution to allow stronger repulsor fire. There is a different take on a leveling system where you don’t spend currency to level up your armor like the current gen game, but your equipment levels up by use. You can switch between different weapons, like a gatling gun or missiles, but they start off fairly weak and you won’t find yourself using them thus making them way less effective than your repulsor at the start and end of the game from lack of use. Of the three versions, the PS2 is the best:. The Wii version has solid controls, but suffers from one major flaw in that you’re melee is mapped to shaking the Wii Remote which also controls the camera whereas the PS2 version has melee mapped to a button press. The PSP version is playable, but falls victim to the lack of a second analog stick problem like most other games on the handheld. While I found myself enjoying the Xbox 360/PS3 and Nintendo DS versions of Iron Man, I didn’t get much enjoyment out of these versions. They are decently designed games, but lack anything exceptional outside of a really cool opening level.